Invented by Ada Coleman at the Savoy’s American Bar, this drink got its name after a patron shouted at it: “By Jove! That is the real hanky-panky!” Hanky Pankys have been around so long they no longer engender excitable exclamation. At The American Bar of today the Martini-style drink is made from Bombay Sapphire gin, Martini Rosso vermouth and Fernet Branca. If you tried a Negroni before you tried an Americano, it may come as a disappointment. The Americano is with soda not gin, so a less alcoholic version of its powerhouse offspring. The recipe is Campari, sweet vermouth and soda and, while balance is importance, the place you drink it is more so. Try the sunny courtyard of the Stravinskij Bar in Rome, one of our Bars to Watch for 2016. It’s certainly where we had our best Americano. This half milkshake, half Gin Fizz concoction was named after the New Orleans bartender who created it in 1888, Henry Charles Ramos. The original saw silky smooth cream and orange flower put a new spin on the fizz. In that transformative vein let’s look to Dead Rabbit’s rendition, which brings leaves and nuts into the fold and replaces lemon with lime. The Pistache Fizz is: eucalyptus tincture, pistachio syrup, green tea-infused Tanqueray, egg white, cream, lime juice and soda. Not many drinks invented in the 1980s made it into the next century but this blackcurrant and gin mix is the best-selling classic in two of our bars and regularly sold in seven. 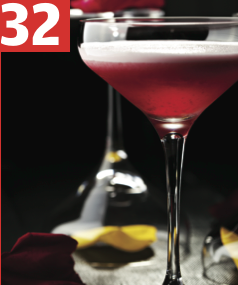 Where else to get a recipe than Edinburgh hot spot and World’s 50 Best Bars six-timer, Bramble. It opts for Hayman’s London Dry Gin, lemon juice, sugar syrup and Merlet Crème de Mures. This is one of the few unserious drinks you are likely to find in a serious cocktail bar. In Italy peach-marinated wine is a traditional thing, so the Bellini draws on this combination, though not always with fresh peaches. We won’t bother with a recipe, as there are only two ingredients. We will bother to say in 9% of bars this was a top-ten classic and in two bars the top seller. Bartenders at the W50BB tend to be on the gin team when it comes to Martinis. So the vodka version, aka Kangaroo and Vodkatini, takes a subordinate role. But if you’re a vodka drinker, this is the best way to get at your poison – with only a little vermouth as resistance. Try Duke’s White Truffle Martini: Chase vodka, Sacred Distillery dry vermouth and an olive stuffed with cheese marinated in truffle vodka. With the Dry Martini and the Vodka Martini both in this list, their lovechild, the vodka-gin-based Vesper is something of a vote cannibal. Still, the Vesper is up five places on last year. Bangkok bar Vesper makes a Silver Vesper with Tanqueray, Ketel One, “Italian aperitif” and orange bitters. Sadly it is not its number one tipple. Overtaking the Brandy Julep this year, the Sidecar is the second most likely brandy classic at the world’s best bars. The original was popular in France in the ’20s and first introduced in London by a man called Mr McGarry, no relation to the co-author of The Dead Rabbit Drinks Manual, from which we found this information. It was made simply from cognac, triple sec and lemon juice. This pink-hued pre-Prohibition classic was invented in Philadelphia and is a top-10 favourite of 10% of the world’s top bars, according to our poll. Julie Reiner’s Brooklyn bar Clover Club – which is a five-time member of the World’s 50 Best Bars all-time – is, of course, named after the drink. The Brooklyn bar uses gin, dry vermouth, raspberry, lemon juice and egg white. But this is a fairly standard recipe that they’d be happy to throw together in most of the world’s best bars. Tiki demigod Don the Beachcomber’s drink of the living dead is the Zombie, which is alive and kicking at the world’s best bars. Four bars said it was their top-selling classic. Let’s take the recipe from tiki Mecca Smuggler’s Cove: Jamaican, demerara and Puerto Rican rums, grapefruit and lime juice, cinnamon syrup, falernum, grenadine, Angostura bitters, drops of Pernod and a mint sprig.